The latest addition to the Mortal Kombat series has been a great trip down memory lane due to the return of many original MK qualities such as the 2D plane, characters, and music. To keep the feeling alive, NetherRealm Studios has been pitching in some quality DLC, with Skarlet and Kenshi recently arriving on-scene. Now another special fighter is ready to hop onto the stage. As promised, Rain will be the next fighter added to Mortal Kombat‘s already extensive line-up of characters. 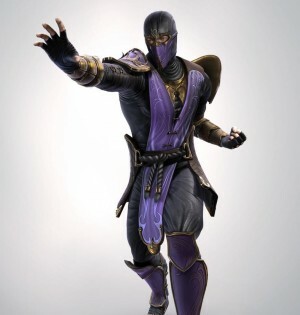 To tease his upcoming release, NetherRealm has released a character render for the masked ninja, and he can be seen below in his full purple glory. Rain’s name derives from the popular pop song by Prince called Purple Rain, and originally appeared in Ultimate Mortal Kombat 3. He is capable of using water and lightning based powers against his opponents, and in Mortal Kombat Trilogy one of his fatalities involved striking lightning repeatedly until the opponent exploded. That’s one way to take care of business. The DLC for Rain currently has no set release date, but will appear sometime this month.